FLYERS y LINK NOTICIA EN ESPAÑOL. I wanted to share with you about an amazing opportunity. As you know, our family has been very involved in the US-based charity here in Santiago, called Vision for Chile. For the past 15 years, Vision for Chile has built orphanages, schools, multi-purpose centers and directly and indirectly supported over 500 children and young ladies in Chile. In the month of October, I have coordinated an opportunity for families to volunteer together and give back to the community and to serve the less fortunate. 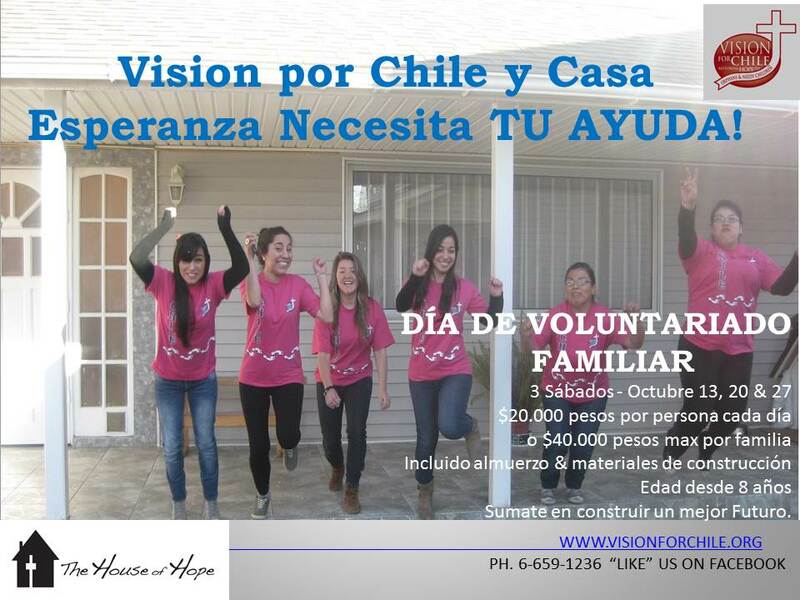 October has been designated as Family Volunteer Month by Vision for Chile. Children ages 8 and up, and their families can volunteer to help make a difference in the lives of children and young ladies in La Pintana. Volunteering as a family can have an impact on our own families, as well as the communities and people we serve. Statistics show that volunteering as a family strengthens the family, helps children learn the values of kindness, compassion, giving back, empathy and respect for those less fortunate. Volunteering creates positive family time and promotes meaningful conversations and teamwork within the family. It sets a positive example for children to learn to be givers in the future. Volunteering increases ones sense of self-worth and accomplishment from making a difference in the lives of others. Studies show that children who volunteer are much more likely to continue as adults and carry on the tradition with their own children (United Way). On 3 Saturdays in October (13th, 20th & 27th), your family can volunteer to serve the La Pintana community. Children ages 13 and up with an adult parent will be working on our “House of Hope #2 – Building Project” where you will spend the day assisting our US construction team in building a second structure behind House of Hope which will add more dorms to receive more young ladies in the future, as well as a micro-business to further educate these girls. Your tasks will include framing, nailing and sheet rocking. For women and children ages 8 – 12, we will be walking 2 blocks to the Las Parcelas Feeding Program – a ministry that Vision for Chile supports. Las Parcelas is a family-run charity that has opened their own home to over 40 street children that come every Saturday and Sunday for a warm meal, nurturing and tutoring for school. We will be working with the children to make a craft, talking with them, sharing and possibly walking to the nearby park to play. At 1pm, we will join together at House of Hope for lunch. The construction team will continue working from 2 – 4 pm, and the younger children and women will assist in making bracelets and bookmarks with the House of Hope girls to help raise funds for their university education. Each Saturday, we will meet in the Nido parking lot at 8:30 am, and maps with directions will be provided or Click Here. The cost for each Saturday is 20.000 pesos per person or 40.000 pesos maximum per family, to cover all the building materials and craft supplies. Lunch is also included in this price. We are limited to 50 people per Saturday and spaces are filling up quickly. Please email me to reserve your spot. We look so forward to sharing this special month with you and your families. 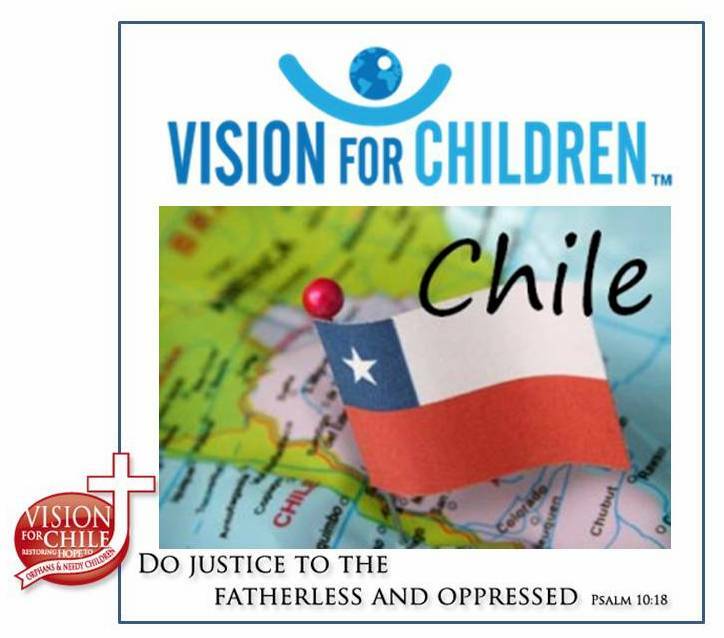 Please visit our website for more information at www.visionforchile.org. Thank you so much!Many blessings to you! Miguel Angel # 02431 La Pintana – Chile.